Newspaper editor James Gannon doesn’t give a damn about journalism being learnt at college. Clashing views with Journalism Professor Erica Stone from the outset, things get complicated as he writes a letter telling her just that. On discovering the Clark Gable blogathon, my thoughts immediately returned to a now still elusive idea – from just over a year ago – for another Blogathon, centered round Gable’s wife Carole Lombard. With sadly still no sign of The Scarlett O’ Hara War (1980) on the telly streaming channel. I plonked for this choice. Primarily because of his co-star Gig Young. As I had a bit of a crush on him in Young at Heart (1954). And after learning Young co-starred with Doris Day again in this film, I fervently hoped she’d go for Gig this time with the happy Hollywood ending I’d craved for their 1954 movie. But deep down feeling, with Clark Gable in the cast this wasn’t to be… so despite this I settled down for this black and white, romantic comedy. The film starts with a wee familiar Doris Day jaunty schoo-wop song, named after the title of the film, Teacher’s Pet (1958). This immediately conjuring up images – sadly only in my head – of Doris Day belting out the title track, wearing a pink shift dress accompanied by at least three white, tuxedo clad, chiselled Jon Hamm lookalike backing singers crowded round a microphone. Gannon is then summoned to see his boss, who tells him he has to guest lecture at journalism classes. Gannon tells him he wrote a letter to the course leader, explaining in his own (gruff) manner about his opposing views regarding that journalism should be not be learnt in a classroom. His boss insists he goes if only to apologise, and Gannon attends. As he enters the room he is taken by a hot blonde named Erica Stone. Its then revealed she’s the teacher, which he is visibly shocked at. She reads his letter to the class. Then – still unaware that Gannon is present – gives a damning – but accurate – character assassination on his character. Gannon then decides on retaliating by not telling her his true identity and masquerading as her student. With a wallpaper salesman job and no journalism experience. Gannon riles her immediately by correcting her when she refers to quotes when relating to journalism. And after she gives him a writing task, she is impressed with his quick and accurate work and apologises to him in front of the class. However despite feeling superior about this for a short time, Gannon finds himself falling for her. After she meets with him to give him extra work to suit his abilities, he takes her in a passionate kiss. But its complicated, with her appearing to be in a relationship with an “egg head” (as Gannon calls him) with “more degrees than a thermometer”. Enter the young, dashing and much educated, Dr Hugo Pine (Young). Pine is a renowned professor and famous writer on all things psychology. This was the first time I’d seen Gable in a comic role, and I really enjoyed this movie with its fun dialogue, witty yet sincere plot and likeable characters. I’d easily put it in Great Films Discovered for Blogathons pile and recommend it if you like any or all of the cast. 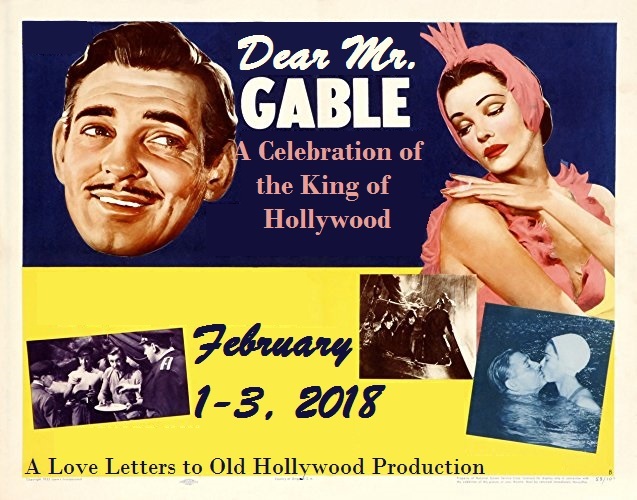 Gable is a charming and debonair leading man, and despite his age difference with his cast, he proves a worthy competitor for Day’s attention. I read the film was deliberately made in Black and White to try to make Gable look younger. However I was oblivious to this large age difference, due to Gable’s screen presence, charisma and wonderful acting. I felt instead attention should have been made to some of the script and the filming which inadvertently reinforced it, rather than distracted from it. For example, when we are introduced to Gig Young’s Hugo character, Gable’s Gannon believes with Pine’s educational prowess he almost ironically believes he must be “up for retirement”. But to his surprise he’s much younger, with one of his colleagues saying how young Hugo is. Additionally, in the film, many of the extras particularly the large number of extras cast as his newspaper colleagues and those in the journalism night school class appeared similarly aged to Gable or looked older, almost in an attempt to Gable him look younger. Gable’s scenes with Day were fun and she made a convincing professor with her severe suits and haircut. Her cruel parody of Gannon’s showbiz girlfriend was uncalled for, and came over as a bit mean. As it felt like the writers had used this as a ploy to get Day singing. Although at times in their scenes together, Gable and Day were a wee bit predictable. In the scene where she reads Gannon’s letter you could feel the pain that Gable’s character was experiencing through her appraisal of him with his facial expressions conveying this to dramatic effect. So I ended up rooting more for Gig Young’s Hugo to be paired off with Peggy. However it was the comedy pairing and on-screen rapport and between Gig Young with Gable that I enjoyed the most. Gannon on meeting Pine led to many more comic moments. Although his then hatred of his apparent rival was visible throughout Pine appeared oblivious of it, as he came over as a naturally likeable and charming man. Some descriptions of Young’s character see him as smug during these scenes, but to me he seems quite innocent as was just being himself and it was this that Gannon disliked in him. Reminding me of similar scenes in My Best Friends Wedding (1997) where Julia Roberts’ Julianne tries to make Kimmy (Cameron Diaz) look bad in front of her fiance, and Michael, their mutual object of affection. With this also backfiring on her. But their later scenes, where Gannon and Hugo’s bromance developed were wonderfully played and without exception the most charming and fun of the movie. As Young’s amiable character made his post hangover omelette, this scene was beautifully shot and orchestrated with this surprising comic double act. Gig giving a natural and lovable performance and showing the softer, nicer side to Gannon, as Hugo gave his much kinder character appraisals. Young easily won my heart again. Along with an Oscar nomination. However the film is Gable’s moment to shine in a comic leading man role, and he shines where I believe an actor of a similar age with Day such as Rock Hudson would have failed.. In his scenes with Day his gruff editor appears with time to soften after Hugo’s intervention, and through his insights the pair come together as a couple learning from each other. But without any spoilers, would those who blog on those movies of yesteryear, please tell me if Gig Young ever got the girl? This review was added to Love Letters to Old Hollywood Clark Gable Blogathon. Other posts with this cast include Doris Day in 5 Golden Hollywood Stars and With Six You Get Eggroll (1968). Gig Young is written about in my 5 Flaming Hotties post HERE. I love this film! Seeing them together in this makes me wonder why Doris and Clark were not paired together more often. Personally would prefer a bromance comedy movie with him and Gig Young. Everyone loves this film- and I haven’t seen it! Its been on my list for ages!! It looks like such a great movie and May I say Gable’s still got it!! (not that he ever lost it!!! Definitely still got it – and love to read your thoughts when you see this movie. I haven’t seen this one in a long time. Your description of the bromance that develops between Gig Young and Gable has me dying to watch this again. Another of Gable’s later comedies which I re-watched recently is A Key to the City which reteamed him with Loretta Young. If you enjoyed him in this film, you might try that one as well. Thanks for the recommendation will certainly check that one out. I’ve not yet seen this film, and I’m intrigued by your description of Gable and Young’s on-screen sparring. Also, to see Gable in a comedy would be a treat. Would definitely recommend it – it was so much fun. I have wracked my brain and I cannot think of one, single movie where Gig Young got the girl! Try City That Never Sleeps (1953). I love this movie and I think it’s one of Gable’s and Day’s most overlooked. It’s a very thoughtful, engaging film with a lot of interesting ideas, such as the debate between education and experience. The cast is also just perfect. You’re right — Gig Young is pretty darn cute in this movie! I’ve also read some reviews that call his character smug, but I don’t think that’s right at all. Maybe it’s just a case of the audience identifying so much with Gable that they look at Hugo with Gannon’s eyes. Thanks for bringing this fabulous film to my blogathon! Thanks for having me – loved this film and great to see Gable in a comic role. Looking forward to hearing your big news soon and reading more on this talented actor.